Discussion in 'The South' started by drumbum540, Apr 27, 2008.
does anybody know of any campgrounds around VA WV or MD? We have a 34' travel trailer but I would rather use a tent, but we would like it to be dog friendly also. I also would like some decent hiking/biking trails. thank you. 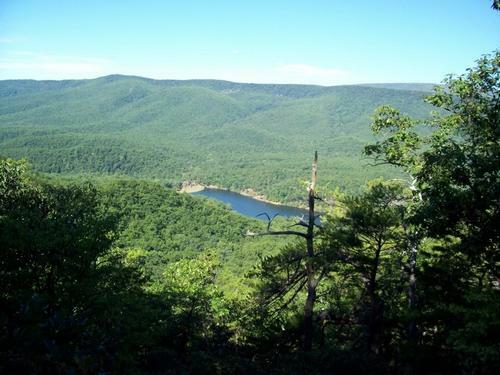 Try Douthat State Park near Clifton Forge, VA. Great hiking/biking trails and dogs are allowed at the campsites. You will have to pay an additional fee for the dog and bring proof of current vaccinations. cool, I just might have to go there! I was at Douthat this weekend and asked in the office about dogs. They charge $5 per day for animals. What animal other than a dog would anyone bring camping? :huh: Lo and behold, a pick-up truck pulled up with a dog and a GOAT!!! Douthat is only about 30 miles from West Virginia. cool, do they have separate trails for biking or do you share with hikers? and what types of trails are they? and what experience levels? thank you. All of the trails are open to hikers and as far as I know the only trail that is closed to bikes is the one that goes around the lake. I think it's called Heron Run. It's never crowded with riders or hikers, and the hikers are always friendly. The trails are not overly technical or steep, just long. All trails can be ridden in both directions. The easiest way to the top on the lake side is up Stony Run. On the ranger station side go up Mountainside and down Brushy Hollow to the suspension bridge. Brushy Hollow is the best downhill there. cool man, i'm definitely going! ill be sure to let you know how it goes! Don't forget your camera. The views are spectacular. This is the view from the cabin at Tuscarora Overlook. wow, that is beautiful i cant wait to go! we actually just bought a really expensive SLR camera, so we should be able to take lots of pretty pics!